Which is true. I mean, it was weird when she got married. She was the first of the “younger generation” to tie the knot, and she married my baby brother who was certainly not old enough to get married, right? But the next three years have been so full of both bridal and baby showers that I hardly blink at the news that yet another kid is getting married and having kids of their own. As I sat there watching the bride and groom share their first dance, I pondered my sister-in-law’s question a little deeper. Is this weird? Is it strange to watch Josh—this boy I’ve known all his life—get married? Yeah. Maybe a little. After all, last time I looked, the kid was about twelve. But is it weird that he’s getting married when I’m still single? No. Not at all. I don’t expect everyone to wait on me. They could stay waiting forever and, as you all should know by now, waiting is not what I am about. I watched Josh’s hands dance up and down Maria’s shoulders and wondered (as all good writers do), what if? What if I was living for this, hoping for this? What if I spent my single years obsessing over the thought of having my turn on the dance floor? Would it be weird then, to witness this moment? I think, in that case, the answer is yes. Yes, this is weird and hard and decidedly unfair. I’m twenty-five years old; Josh is just a baby. But I don’t live for him. Him—the elusive someone who is supposed to come sweeping into my life and become my everything. The someone I’ll wear a white dress for. The someone I’ll devote the rest of my days to. If I’m going to be honest, I thought I’d be married by twenty-five. As a child, it seemed as good an age as any to start settling down. As an adult it seems sort of like a cruel joke I played on my future self. That’s right, make plans, Rebekah. It will be so amusing to see how unexpectedly your life actually plays out. This is perhaps the part of the story where I’m supposed to become angry and jaded and bitter, but that seems to sad of an ending, so I rewrote it. I took this unexpected mess of a life and decided I wanted something different than a fist to shake at heaven. I wanted something more magical, more unpredictable, more poetic than that. I wanted a life I could fall in love with. So I threw myself into my work, and befriended coworkers and customers alike. I signed a lease and started collecting things to furnish a home of my own. I filled journals with stories and ideas and words that may or may not be better left unsaid. I am trying to be spontaneous and adventurous and vulnerable. I am striving every day to let down my hair. Would I like to be married? Sure. Maybe one day. But not at twenty-five. Twenty-five has a different ending in mind for me. And that’s okay. Different than I once expected, but okay. Some people say that every girl deserves a man who will treat her well. And maybe they do. But what I hope that every girl has, regardless of her relationship status, is a life she can fall in love with. Love your life, darling, and if you don’t, rewrite it. Make it the kind of life you can be proud of. Make it the kind of life you can find joy in. Make it the kind of life you can fall in love with. It’s amazing to me that there is a critic who would honestly think a girl is too young to be brave, when I’m sitting here on the other end of the spectrum thinking she is far too old to experience bravery for the first time. Darling, if twenty-five is when you finally feel ready to face the danger, I can’t imagine how fearful your childhood must have been. Because Brave is not for after you’ve survived it all; Brave is for a lifetime. You don’t need Brave once you’ve overcome; you need it for right there in the thick of the storm when the waves are crashing onto the deck and the ship is starting to crack in two. Brave is for the band of children trekking deep into a forest that may be filled with coyotes and Indians on the warpath. Brave is for the ten-year-old child who watches her grandmother succumb to cancer. Brave is for the fourteen-year-old girl afloat deep in the ocean, urging her little brother to just keep swimming toward shore. Brave is for the nineteen-year-old aspiring author, clutching a manuscript to her chest as she prepares to offer it up for rejection. Brave is for the twenty-one-year-old young woman realizing everything she has ever dreamed of is not everything she imagined it would be. Brave is for the new teacher, cradling a child whose whole world has fallen apart around him, trying not to fall apart with him. Brave is for the girl with the broken heart, picking up the pieces and deciding she will love again. Baby, you had better believe I wouldn’t be standing here today if I hadn’t learned to strap Brave to my shoulders like a parachute. I would have crashed. And burned. And died. And I’m not even twenty-five yet. But how else does a girl survive the way the world likes to throw her about even as it goes on spinning if she does not resolve to be Brave? So if you think Brave is a cloak that doesn’t fit your shoulders just right, maybe you need to stand a little taller, darling. Just straighten on up and tug it snugly into place. I think you’ll find, with a little practice, that it fits you prettier than you might think. Do me a favor and set the lies aside. Stop believing you’re too young, and that your life is too pretty, and that you have to live a little before you can staple Brave to your name. You deserve a lifetime of bravery. I hope you find it. I hope you find it. It was my first piano recital. I had played the piece a hundred times, so I was familiar with it’s dark, slow rhythm. But I wasn’t familiar with the roomful of people who all had their eyes upon me. I placed my little fingers on the keys and let the music fill the air. When it was all over, my grandma wrapped me up in her arms and told me it was the best she had ever heard me play. She sounded sincere, but I knew she was lying. I had played the piece for her before and executed it flawlessly. I missed two notes during my actual recital. And the perfectionist in me beat myself up for it so severely that I still remember it fifteen years later. I’m not exactly sure why I’m remembering it now. Not sure why I’m thinking about fumbling over notes and how that relates to my life today. I’m working my first secular job now, and it has made me think about how to live like Jesus in the world around me. Made me start wondering what to say and what to do and how to make my life add up to something that points toward heaven. I can do a lot of thinking. And I can practice the words until they flow through my mind with all the practiced rhythm of that old recital piece. But then I get out in the world. And everyone’s eyes are on me. And I get nervous. And my palms start to sweat. And I fumble over some of the notes. So I’m standing there last night with my co-worker, realizing this girl needs Truth in her life, but fumbling over a way to deliver it. Because all The Answers my mind is conjuring in that moment might sound a lot like judgement to someone who doesn’t know how much I love her wounded heart. So I listen. And I nod. And I’m honest in those moments when I say I wouldn’t make the same decisions and, yes, her brother has legitimate concerns and she shouldn’t be upset with him for caring that deeply. But the perfectionist in me lies in bed at night and scolds myself for doing it wrong. And as my mind rehearses all the things I could have said better, God shows up. And God whispers, sure and strong, “You’ve been practicing that song forever, but it’s pretty worthless when there are no ears to hear it. But I saw you, just when you were poised above the keys. I recognized the very moment you realized a different song was needed. So, no, I’m not upset that you improvised. I’m not disappointed that you chose a different melody. And I don’t care that you fumbled over some of the notes. Because your heart was in that song, and I’m not the only one who noticed. This blog has been shrouded in silence because life has offered little to speak of lately. Well, little Big Things anyway. That’s what I’ve been waiting for—something big. Something earth-shaking. I’ve been waiting for words big enough to wrap the whole world in the power of them. Maybe that’s ridiculous, but it’s what I want. It’s what we all want, really. Every time we post a status online, we are searching for validation. Validation, on a large scale, is a stupid dream. Of course we want approval. Of course we want affirmation that our words and our actions and our lives have value. But you don’t need dozens or hundreds of people for that; you just need one. Last night, my brother walked out of his bedroom with this big, stupid grin on his face. His eyes were glazed over, his mind somewhere else. I recognized that look because it’s the same one that was on my face when I finished reading Vicious and Cress and Everbound. It was the smile inspired by a story that roused a heart to its feet. And, in Micah’s case, I put that smile there. It was my manuscript that was still tripping through his mind. My characters that had won his heart and captured his imagination. In the eight years I’ve spent dreaming of becoming a published author, this was the first time I thought I would be okay if that dream never came true. I could have written this book for Micah, and that would be enough. We don’t realize often enough that the impact we have on a single life is important. We want numbers. And the internet has made it easy to put a number on our worth. So many likes on this status. So many hits on this blog. And we’ve given numbers the power to either make or break us. They break us more often than not, because it will never be enough. There could always be one more. There could always be one thousand more. We miss the immeasurable moments of our lives because we’re waiting on the big things—publication, promotions, marriage, children… Always looking for the next best thing and failing to realize the value of the small moments. Because the little things add up. They may not boast the big numbers, but once you collect enough moments, they really add up. Because your worth is not measured in the status that got seventy likes. It is not measured in the blog post that went viral. That was just one moment. One moment out of many that happened to capture the eye of more people than you may have expected. I could get published. I could become a New York Times bestseller. And I won’t lie and say that the numbers won’t mean something to me. But numbers—no matter how high they count—could never be as real as the smile on my brother’s face when he first read my words and declared them good. I’ve been floundering these last few weeks, trying to find my footing in the world again. I’ve been waiting for big events and failing to delight in the small. Life doesn’t “begin” when I finally get a job again; life has been happening for a long time now. Snuggling on a couch with my sister, laughing at the latest YouTube video we’ve discovered together. Watching my brother do a happy dance as I print the last two-thirds of my manuscript for him. Noticing the slight swell of a belly on my sister-in-law. When my mother comes home from Goodwill with an exact replica of a pan she has possessed all my past… to put back for my future. These—the things cannot be measured in numbers—are the important things. And it is these moments that hold me when the numbers fluctuate and the world rocks crazy and I don’t know where to stand anymore. Oswald Chambers said that faith is deliberate confidence in the character of a God whose ways you may not understand at the time. I like that. I like that faith is not just a shot in the dark—a frantic grasping at something unknown. While the circumstances may be uncertain, our God is not. We can be confident in His character. We can trust our Father’s heart. That’s what faith is, isn’t it? It’s being that child who launches himself into his father’s arms, never doubting that his daddy will be faithful to catch him. I’ve watched a lot of children interact with their fathers. I’ve had a lot of children place their unwavering trust in me. Believe me when I say that kids don’t hesitate, not once you’ve earned their implicit trust. They don’t stand at the drop-off and wonder if this will be the one time you fail to catch them. They just jump. I remember so clearly that day at the beach. I was maybe eight or nine at the time—old enough that I should have been confident enough to play in the ocean waves, but I wasn’t. I never did like water. I always did fear the unknown. So I sat on the shore and watched my family splash in the surf until my dad decided he wanted me to be more than an observer in our family vacation. I was hesitant, but he promised he wouldn’t let anything happen to me. He promised he wouldn’t let go of my hand. When that wave washed over my head and ripped me from his grasp, I was angry. There I was, somersaulting through the surf, wondering when I would finally get the opportunity to breathe again, and thinking of how my father had betrayed me. He promised nothing would happen. He promised he wouldn’t let go. 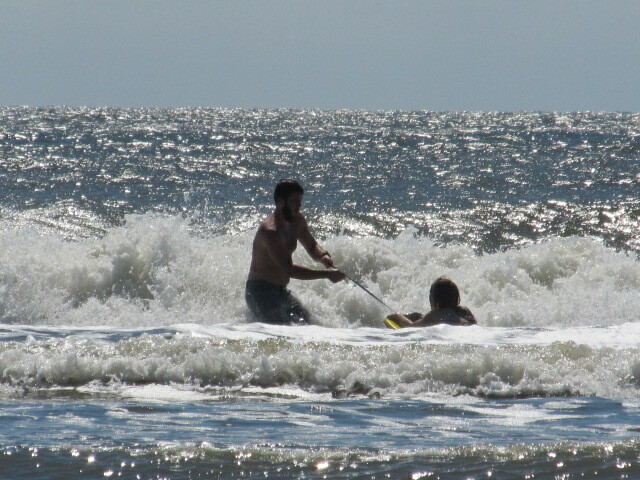 I think we have it on video… that moment where I stormed back to shore and buried my face in my knees because I didn’t want to look at my dad after that. But when I think back to that day at the ocean, I realize that maybe Dad wasn’t the one who let go. Maybe in that moment the water crested above my head and my mind started screaming at me to retreat, I did exactly that. Instead of bracing myself for impact, I let go of my father’s hand. And my feet came up, and my head went down, and the sky and the sand and the sky came to meet me over and over again. And when I finally came up, sputtering for breath, I was too disoriented to realize that he had been right there all along, reaching to pull me back to my feet, keeping his promise that he wouldn’t leave me alone in the ocean. This happened with my earthly father only once, but I cannot even begin to count the number of times I’ve braved the waves with my Heavenly Father only to find myself running scared when the waters rise above my head. I think I’ve finally reached the point where I’ve stopped accusing Him of being the one to let me go under, but I don’t know if I’ve quite reached the point where I fully trust Him to hold me steady when the waves come crashing down. Because I don’t want to be afraid of life. I don’t want to be beaten by the waves. I want to live with deliberate confidence in my Father’s character. I want to face the ocean with Him. I want to say to the entirety of the sea, “You cannot defeat me.” Not because I am stronger than the tides, but because my Father commands them. I wonder what it would have looked like that day at the beach had I not turned back toward shore when that wave began to swallow me. I wonder what would have happened if I had clung to my father’s arm instead. I wonder if I would have opened my eyes to find us standing safely on the other side. It’s too late for my childhood self, but not too late for the Rebekah who wades the oceans of life with the God who spoke them into being. So as this next wave rises above my head, I don’t think of retreat. My Father has my hand. My Father has my heart. My Father has my faith. The thing about living in the Blue Ridge Mountains is that sometimes I have an awesome view out my bedroom window, but other days, it’s not even worth opening the blinds. 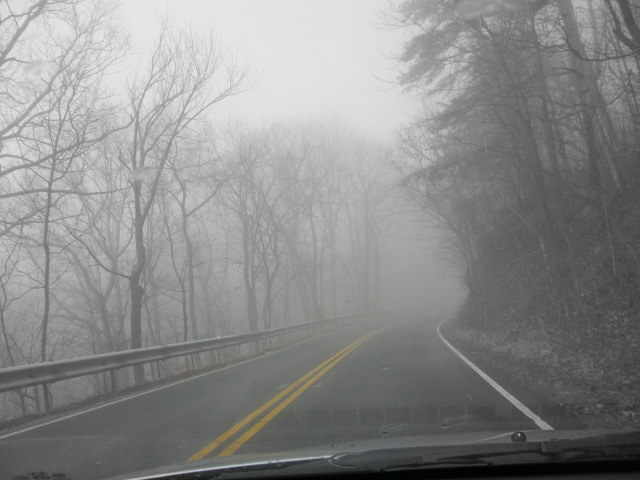 Driving through fog is not the most fun thing in the world. In fact, it’s a little disconcerting to not be able to see beyond the narrow stretch of road you’re on. Because I can’t always see Him at work in my life. I don’t always know what He’s doing in the midst of the messes. I don’t know how to cope in the fog. Sometimes I catch a glimpse of Him, rising up through the fog of my life. And even if it’s just for a moment before I descend into the valley again, I’m comforted. Even though I can’t always see Him, even though I don’t know what exactly He’s doing, I know that He’s there. I know that He’s working. 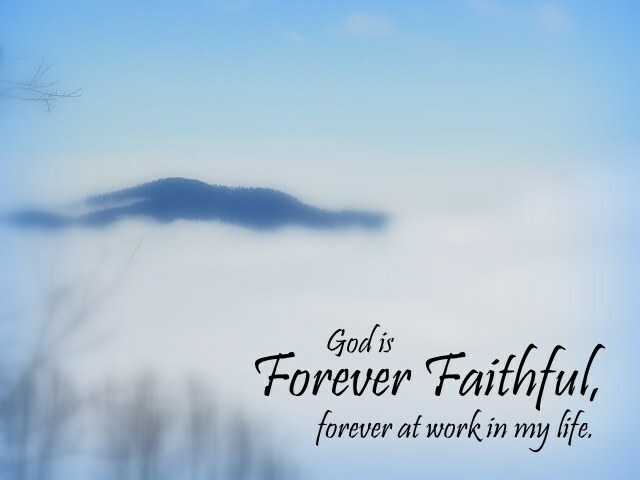 I know that He is faithful—forever faithful. He has been so good to me, so real to me, ever-present when I need Him most. And so I continue through the fog, unsure of what lies before me, but certain of the One who paves my way.